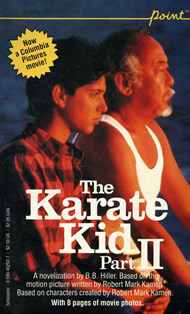 Without question, The Karate Kid was my favorite movie as a kid and continues to be one of my favorites to this day. 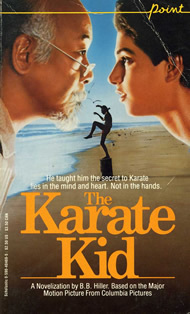 When the opportunity presented itself to buy the book version of the Karate Kid trilogy through a school-sponsored book sale, there was no doubt where my money was going. Buying the books was not enough, though. I needed something to mark my place as I read through the book versions of movies I'd seen countless times. I couldn't use just any old scrap of paper as a bookmark. My place needed to be marked with a reminder of my obsession with this movie. 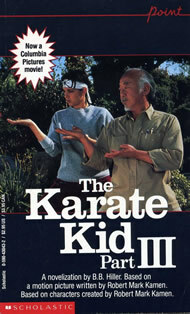 Looking back, I realize that this bookmark was intended for young girls in love with Ralph Macchio more than it was for 10-year-old boys who thought the movie was cool. Either way, B. Dalton took my money.